!Quick Screen Capture will allow you to take screenshot from any part of your screen with just a few mouse clicks. You have as many as 10 ways to capture screen, and edit the images with many useful tools. The images can be saved in BMP/JPG/GIF formats. !Quick Screenshot Maker is an all-in-one tool for screen capture, screenshot editing and image organization. It includes all the features of "!Quick Screen Capture", and many other powerful functions. You can add many effects on the images. Enhance the captures by adding annotations like text, balloons (callouts), shapes (highlights) and images. !Quick Screenshot Maker help you to make professional screenshots easily and quickly! 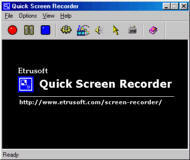 Quick Screen Recorder is a video screen capture, screen recording tool used for recording screen activity into standard AVI video files. If you move the cursor, launch a new program, type some text, click a few buttons, or select some menus -- anything that you see on your screen -- Quick Screen Recorder will be able to record all these and even the sound. Do you want to create your own screensaver with your favorite photos and music? All you need is Easy Screensaver Maker! This software will allow you make professional slideshow screensaver easily and quickly with image files and sound files. It's as easy as step 1, 2, 3! 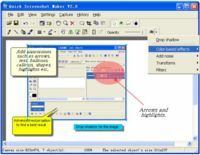 Easy Graphic Converter (v 1.2.0) Free! Easy Graphic Converter is an easy-to-use and powerful image converter tool. It supports converting batches of graphic files between 10 popular formats. It can create image thumbnails in batches, too. Advanced Image Resizer is a batch image converter and resizer which gives a better result than easy graphic converter. And it can rename output images, add watermark on images, and create your own web image gallery quickly and easily! Copyright 2000-2011 EtruSoft.com Screen Capture Software. All rights reserved.